Looking for a brighter, whiter smile? At Walbridge Dental, we offer many options to enhance your smile cosmetically. Procedures we offer include teeth whitening and cosmetic veneers, as well as others. For more information, or to book an appointment, contact us or visit our office in Millbury, Ohio. Teeth whitening at Walbridge is quick and easy. The procedure is painless, and results typically appear within a few hours. Although teeth whitening is a simple procedure, it isn't for everyone. This treatment is most effective for those with healthy teeth and gums, and how long whitening lasts depends upon many factors. Do you have more questions about teeth whitening? Visit our FAQ, or email us at info@walbridgedental.com. Are you interested in creating a more beautiful smile? Are you concerned about the uneven, stained, or misaligned appearance of your teeth? If so, cosmetic veneers may be for you! A veneer is a porcelain facing which is bonded/cemented to the front part of your natural tooth enamel. If you maintain your oral health, your cosmetic veneers could last for many years. Cosmetic dentistry is all about making your smile look brighter and better. Cosmetic veneers can do just that! If you are unhappy with your smile, and you haven't responded to whitening services, it may be time to consider cosmetic veneers. Another reason many people consider cosmetic veneers is durability. Veneers are made from very strong, durable materials, such as porcelain. 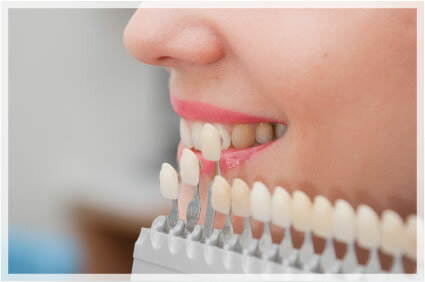 As long as you care for your veneers and maintain good oral health, your veneers should last several years. At Walbridge Dental, your comfort is very important to us. We are committed to answering your questions and helping you decide if veneers are for you. If you are considering cosmetic veneers, please contact us for a consultation.